ASOPRS is proud to mark its Golden Jubilee in 2019, celebrating 50 years of excellence and leadership in the field of oculofacial plastic and reconstructive surgery. Authored by David Reifler, MD, Archives Committee Chair. Thanks to the YASOPRS Committee for their development of these videos! Look for them during the 2019 Fall Scientific Symposium. 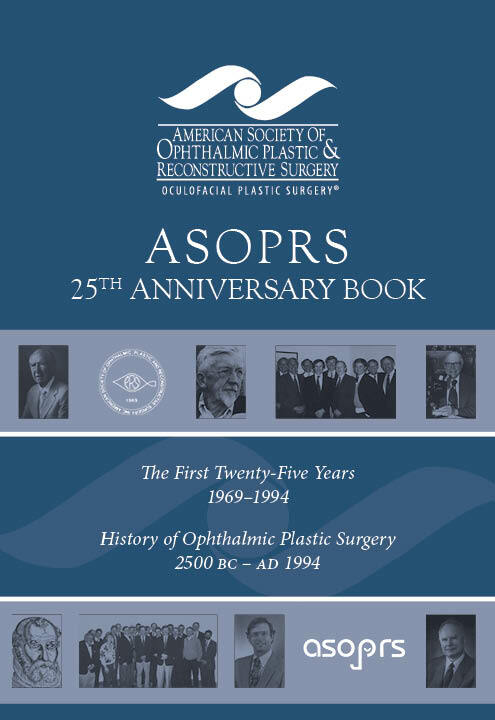 ASOPRS is pleased to present the 25th Anniversary Book in recognition of efforts and a tribute to all those who helped in the founding and success of the organization. Click here to access the digital flipbook of the ASOPRS twenty-fifth anniversary book. Acknowledgements: The digitization of this 1996 publication was undertaken at the suggestion of the ASOPRS Foundation whose support is gratefully acknowledged. ASOPRS Fellow John Nguyen was of great help in investigating digitization options.